We all make arrangements to protect the furniture at our home indoor furniture and garden furniture. Indoor furniture is most vulnerable to dust particles, and without regular dusting, the chances are that the life span of your indoor furniture may be cut short. Insect or weed attack is another threat that can undermine your indoor furniture be it tables, chairs or benches. Protection of indoor furniture is not a much big issue if you do regularly dusting. Keeping it clean or in another case, putting a strong cover over it would do the job for you. Furniture is a big investment, so its protection is a priority for any household. Furniture is a fixed asset and a long-term good. So, it is important we take steps that guarantee its protection and increases its life. The patio furniture is a matter of concern for all. Yes, you are right! I am talking about the outdoor fixtures. Garden furniture looks at best when placed in the garden but the question how you are going to safeguard it? It is because the outdoor furniture much more exposed to external threats than your indoor furniture. Taking the indoor furniture inside when the weather seems unpleasant may not be the right approach. First, we have to look at the external factors that can spoil your outdoor furniture. We will discuss them one by one. Every weather seasons brings about a unique bit of challenge for your garden furniture that we have to face head-on with a sound solution. If we talk about summers, the major menace to your outdoor furniture is the UV radiations. So, if you keep the furniture open to UV, the furniture is going to rot out, fade out and will lose its colour, shine and newness which is what you don’t want. Winters will pose its peculiar threats in the shape of frost, Moist and dew while rain will present as the continuous threat that can cause havoc to your garden furniture. Bird dropping is also one thing that can tarnish and mar your patio furniture anytime. Instead of letting the furniture exposed to weather adversities, one needs to look for a sustainable and stable remedy. This remedy in nothing else than a coverage to the tables, chairs, benches, hammock swing and BBQ range, etc. The remedy should be comprehensive and thorough that gives ultra protection to your outdoor furniture from every kind of weather warning. Here are a few handy tips to look after your garden furniture. There is no better solution to your garden furniture than the polyethylene covers. I am going to back it up with some substantial points that will help you understand why. Firstly, the polyethylene garden covers are strong, sturdy and hard wearing. It means that the covers can withstand almost every weather condition successfully. You can even test out the heavy duty polyethylene covers by putting up against harsh weather conditions, and it will keep the bad weather at bay. Polyethylene cover is strong attire that is long-lasting and is one of the best options if not the best option for your garden furniture. Its cloth is rainproof, well made and has the best tear toughness that soundly protects your garden fixtures. 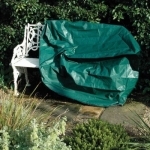 No matter how strong and durable a polyethylene cover is, you still have to cover it properly for the absolute safety of your garden furniture. Leaving the cover exposed a little would be as damaging as you have left it completely exposed. If there is a heavy wind, it may take the cover off and you furniture remains unguarded and unshielded. Therefore, it is a crucial thing to keep in mind that you completely wrap the cover around the furniture. In addition to this, there are accessories connected with the garden covers such as cords, strings, toggle and eyelets. So, fasten the furniture to ensure proper preservation of the patio furniture, if you don’t do it rightly, you have only got yourself to blame. There are many companies found selling polyethylene garden furniture cover that chants theirs is the best quality covers leaving your confused. You have a lot of choices leaving you choiceless because you want the real material, the real polyethylene fabric not the one that is said but is not so real. In UK, there are many dropshipping companies where one can find real and quality garden cover stuff that can guard your outdoor furniture against every weather threat. UK is a place where the weather seems to be unpredictable and mercurial so it an important product over there. As a result, the garden covers sellers make it premium quality because of its demanding nature. So, one should sift through the top to get the best among the best. With all the steps and strategies, we have come to know that the polyethylene garden covers are the best bid for your garden furniture. The next big question is to locate the best resource from where you can get the quality that you are looking for. As an online retailer, eBay buyer or Amazon buyer, what you want is the long-term solution because climate and weather have a great say and you want to tackle that. There are garden covers dropshippers that offer you strong and sturdy covers that take care of your garden furniture effectively and desirably. Get services from the best garden covers dropshippers and feel the real difference.